From the coast of Namibia, this salt is formed by the cold Atlantic waters being pumped into vast salt pans, allowing it to crystallize under the warm dessert sun. It is then harvested and graded, keeping aside the cleanest and chunkiest of crystals – only the best for us of course. 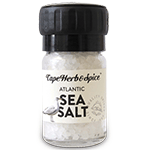 We can thus ensure you have the best quality salt in your kitchens and on your tables. Product of Namibia.